Being a cop for the last 45 years serving on three continents, competitive shooter, collector and hunter, I very seldom get excited about a new firearm. 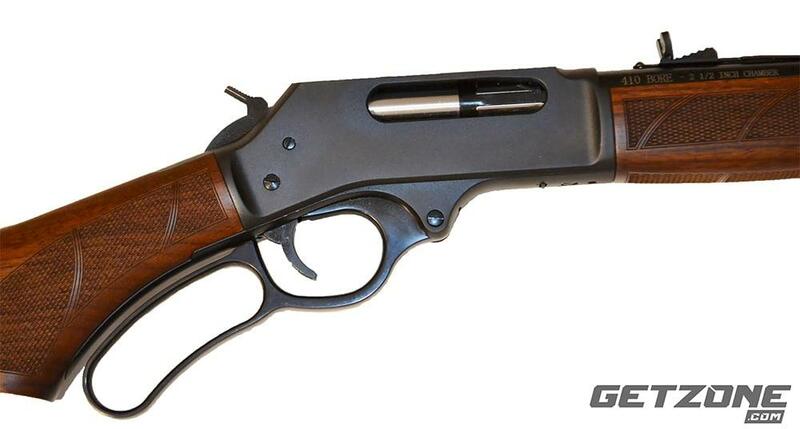 However, along comes Henry Repeating Firearms and produces an outstanding lever action .410 shotgun. To be precise, the model H018-410R that sports front and rear rifle sights and a 20″ smooth bore barrel. They also produce the H018-410 which sports a 24″ barrel with front sight only. Out of the box, the quality and workmanship is excellent. Most all .410 shotguns are fairly light, but the Henry lever action doesn’t follow this trend. When I first picked up the shotgun, I was surprised at the weight — 7.8 lbs. This shotgun was built strong like a big-bore rifle. The Henry lever action .410 shotgun was based on their tried and true 45/70 frame making it a strong and durable shotgun. During my testing of the Henry lever action .410 shotgun I realized several other uses for this firearm other than hunting small game and tasty feathered flying targets. I strongly believe the Henry .410-lever action will prove valuable for taking deer with the proper load. It would also be good for varmints out to 100 yards. For home defense, it provides just the right amount of firepower. For camping and survival, this firearm is the all-around tool. The Henry Lever Action Shotgun is well suited for taking deer. Because this shotgun has rifle sights, I fired several .410 slugs at targets out to 50 yards. 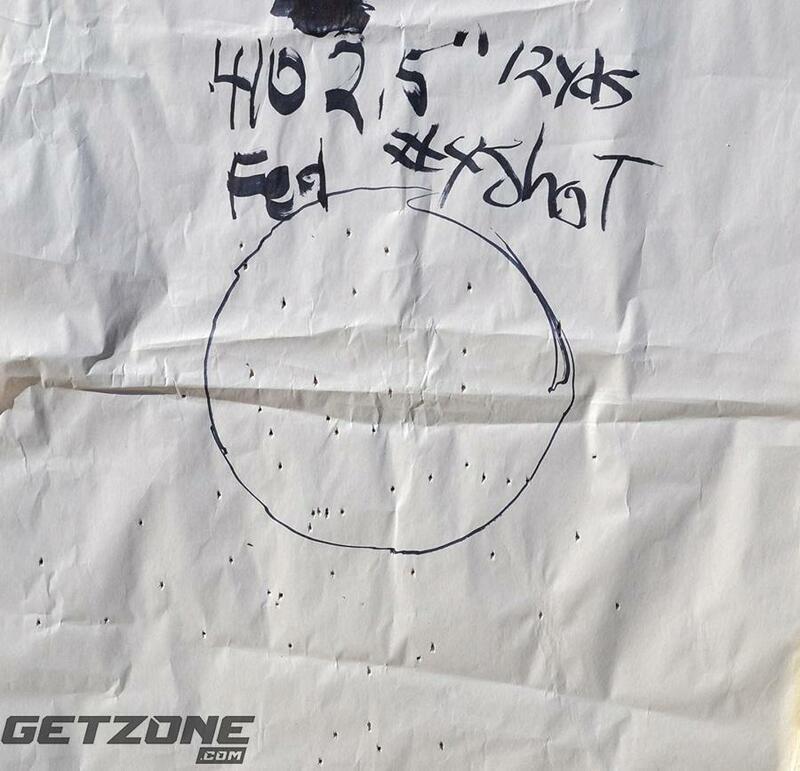 Straight out of the box this Henry .410 shotgun with Federal ¼ ounce Maximum Rifled Slug Hollow Point punched a hole in the center of the target. At one hundred yards I ramped up the back sight halfway. I fired the Federal slug, which struck the target low center or about 3″ off center. The only adjustments needed were elevation. After spending some time shooting this shotgun, I feel confident I could take a deer out to 100 yards. At 50 yards the Federal and Winchester slugs penetrated a ¾” plywood board. The rear sight is a modified “Buckhorn” style with a metal stair-step ramp for elevation adjustments. There is a very handy white diamond placed on the sight-face directly below the notch. Another good use for the .410 lever action shotgun is those pesky fur and feathered varmints who come along and cause damage and disruption on your property. I know my Uncle Mike, from time to time, has problems with fury and feathered critters on his farm. Short of mountain lions, hogs and bear, he has the full range of varmints. To further test and curtail the furry devils, I loaned Uncle Mike my Henry lever action Shotgun. A couple of weeks later I returned to the farm and spoke with him. He said, “This gun is well built, could be passed down to your great grandkids.” Now for my 85 years young Uncle Mike to say this, is quite unusual. He didn’t elaborate but I know some resident armadillo, gofers and a pesky pecan stealing raccoon have come up missing. The local coyote population seemed smaller too, which makes the barnyard cats happy. 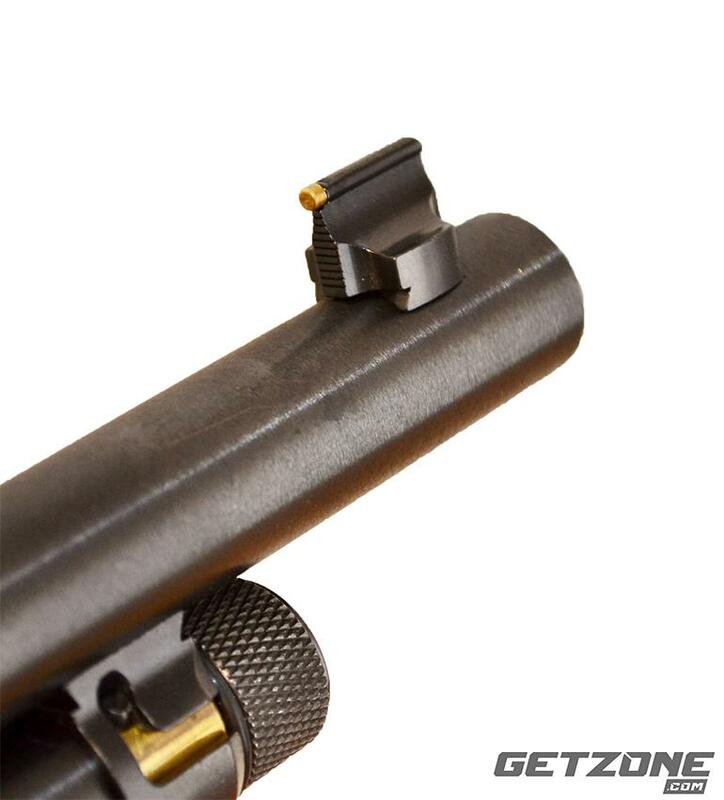 The front sight is dovetailed to allow for tapping it to the left or right for windage adjustments. This sight is accentuated with a substantial brass insert. I know in these current times of what seems like higher incidents of violent crime and home invasions, there is a real need for a home defense firearm — the Henry lever action shotgun can fill the home defense role quite well. This shotgun has minimal recoil, which makes it ideal for even the smallest shooters in the house. Short of the slug rounds, this Henry shotgun loaded with “000” Buck or .410 Hornady Critical Defense rounds would be devastating to any unwanted visitors with bad intent on their minds. From my testing, the Winchester, Federal “000” Buck and Hornady Critical Defense rounds are not likely to penetrate out of your home injuring others. As a law enforcement officer, I have investigated many shootings. I learned flying metal sometimes would amaze you with its penetration or lack of. So for your neighbor’s sake, don’t go with high penetration ammo. Federal No. 4 birdshot was fired at 12 yards. 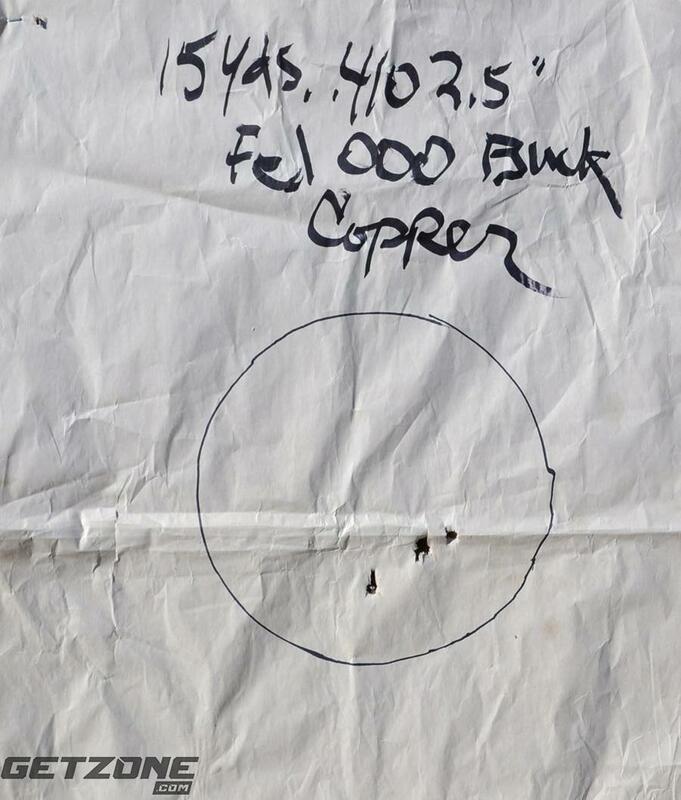 Federals’ copper plated “000” Buckshot was fired at a distance of 15 yards. 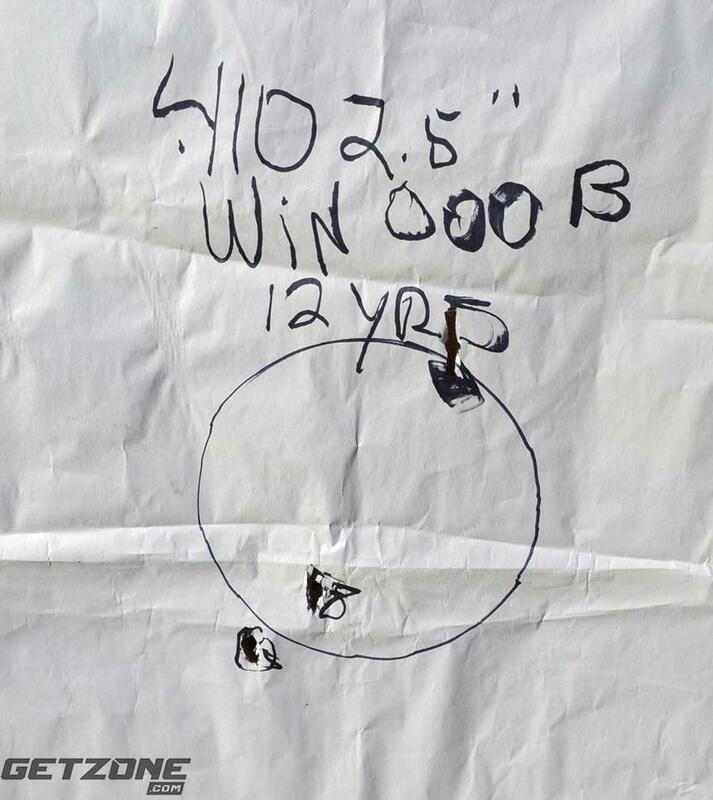 Winchesters’ “000” Buckshot was fire at a distance of 12 yards. Near and dear to my personal liking is camping out in the RV with the wife or leaving her in the RV and packing off into the hills or mountains. Since both of us are comfortable using the .410 we can save space in the RV. When I pack off into the Desert Mountains south of the Colorado River or up into the pine-laden mountains of Western Colorado, I normally take a serious handgun and depending on the predator potential, I will take a shoulder-fired weapon. I have no intentions of killing anything be it two or four legged. I just like to be ready — just in case. In future packing adventures, I will be taking my Henry Model lever action shotgun with slugs and “000” Buck. If there is small game in season, I will take some number #4 birdshot to collect some camp meat. For a camp gun and backpacking companion you just need to check out the Henry .410 lever action Shotgun. 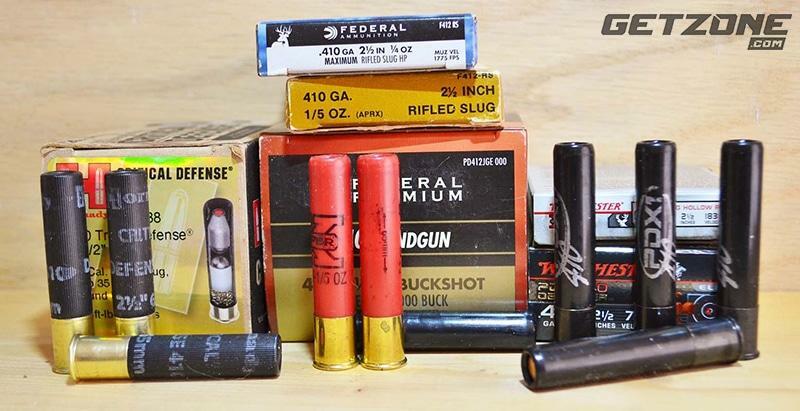 Ammunition for the .410 ranges from small game loads to dedicated personal defense loads. Henry’s lever action shotguns are currently a highly sought after firearm. I have been at several large box stores who handle many firearms. Either they received and immediately sold out or they have never had one in stock but have them on back order. Henry’s products are first quality USA made firearms. They are highly prized by all who own them. My test sample performed flawlessly. It was more accurate than I would expect from a shotgun when firing slug ammo. I was very impressed with its grouping of “000” Buck rounds and its birdshot shells. The versatility of this firearm is very apparent. Accessory: Swivel studs fore and aft. To load Henry, you must turn the top of the magazine tube to release the stud, which holds it in place.